Watercress is in the same family as mustard and cabbage,with a somewhat bitter, peppery taste. The vegetable is full of vitamins, minerals and antioxidants. A serving has more iron than spinach and provides 312 percent of your daily vitamin K requirements, according to Food Facts. 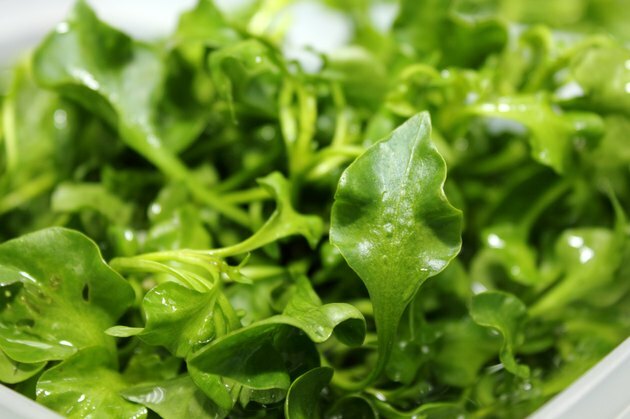 It also contains lutein, vitamin A, manganese and vitamin C. Three cups of watercress have 11 calories, 1 gram of carbohydrates and 2 grams of protein. You can easily serve raw watercress in a salad, sandwich or smoothie, but you can also steam or saute the plant. Prepare the watercress for use, if you have bunches still attached to the roots instead of a bag of ready-to-use watercress. Wash the watercress in cold water. Trim off the stems with a kitchen knife. Dry the watercress leaves with a paper towel or put in a salad spinner to remove the excess moisture. Follow the directions for your steamer. If you're using a pot with a steamer insert or metal colander, fill it with enough water to just touch the bottom of the insert or colander. Add the watercress to the steamer, insert or colander, depending on your equipment. Reduce to medium heat and cover the steamer or pot to keep in the steam. Steam watercress for approximately one minute, just until the leaves wilt. Season to taste with salt, pepper or other preferred flavors. Heat oil in a dry skillet on medium heat. Add watercress to the heated oil and stir with a spatula or cooking spoon. Continue to toss the watercress in the skillet for 45 seconds or more until the leaves wilt and the stems are tender-crisp. Serve immediately. According to "The Flavor Thesaurus: A Compendium of Pairings, Recipes and Ideas for the Creative Cook," watercress pairs especially well with goat cheese, walnuts, grapefruit, eggs and oily fish, like trout. Season your watercress with your preferred spices. You can also add bacon, onions or garlic when sauteing. Start the items that need to cook longest first and add the watercress near the end. You can also steam watercress in a skillet without a steamer insert. Put the greens in a large skillet and add a small amount of water. Bring the watercress to a boil, push it into the center of the skillet and cover with a lid large enough to cover the greens but small enough to fit inside the skillet. You want a tight fit. Steam for one to three minutes before checking for wilting and tender-crisp stems. Steam longer, if needed, checking every 30 seconds. Wild watercress can harbor liver flukes, so either acquire it from sources you know are safe or thoroughly cook wildly collected watercress to kill any liver flukes. Food Facts: What Is Watercress Good For?